Joe Lynn Turner, is an American singer, known for his works with hard rock bands Deep Purple & Rainbow. 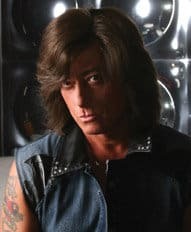 In a career that spans nearly 30 years and includes over 60 album credits, Joe Lynn Turner (“JLT”) remains one of rock and roll’s most distinctive, soulful and expressive vocalists. Born August 2, 1951 in Hackensack, New Jersey (U.S.A.), he played the accordion as a child, grew up with an appreciation for classic Rhythm and Blues (R&B) and became an accomplished guitarist in his early teens. In fact, his first band, Filet of Soul, featured singer J.T. Taylor who would later have success with Kool and the Gang. While in high school, Joe formed Ezra, performing original material and cover songs by artists who were a great influence on him: Jimi Hendrix, Free and Deep Purple. In 1976, JLT enjoyed his first taste of national success with Fandango, a band described as an eclectic mix of R&B, pop, country, jazz and melodic rock. Turner sang and played guitar on all of the band’s four albums. Fandango toured with numerous artists including The Allman Brothers, The Marshall Tucker Band, The Beach Boys and Billy Joel. In 1984, Blackmore reunited with Deep Purple. This gave Turner freedom to work on his first solo album, “Rescue You,” produced by Roy Thomas Baker, known for his work with Queen and The Cars. JLT co-wrote most of the songs with keyboardist Al Greenwood (Foreigner). The first single, “Endlessly,” received extensive airplay on radio and MTV. A tour with Pat Benatar and acting role in the movie, “Blue Deville” followed. Turner also proved his versatility by working with a diverse array of artists, including Billy Joel, Cher, Michael Bolton, Mick Jones (Foreigner), John Waite (The Babys). Bolton also encouraged him to enter the lucrative business of singing and doing character voices for radio and television. This would afford Joe a steady income that was not reliant on the commercial success of any band or project he decided to get involved with. In 1987, JLT became a member of Yngwie Malsteen’s Rising Force. Their union resulted in “Odyssey,” the most commercially successful album for Malmsteen up to this point in history. A follow-up world tour was highlighted by ten “sold out” shows in Russia that were recorded for the “Trial By Fire: Live in Leningrad” album and video. In the winter of 1989, Ritchie Blackmore and Deep Purple needed to find a lead singer to replace Ian Gillan. Several high profile vocalists were considered. In a second ironic twist of Fate, Turner was invited to audition and found himself fronting one of the major bands he was influenced by as a teenager! They released the album, “Slaves and Masters” and launched an extensive world tour in the midst of The Gulf War. While many bands cancelled their tours, afraid to travel during turbulent times, Purple and JLT forged on. Turner wrote and sang on several tracks for a follow-up album that were never officially released. To this day, Blackmore maintains that “Slaves and Masters” is his favorite Deep Purple record since his reunion with the group in 1984. Joe took on many projects after leaving Purple. He joined Carmine Appice (Ozzy Osbourne), Bob Daisley (Ozzy Osbourne) and Jeff Watson (Night Ranger) in the progressive rock band Mother’s Army. He toured the U.S.A. with his own “JLT All Star Band.” He eventually returned to the studio for his second solo effort, “Nothing’s Changed.” In 1997, JLT recorded the first of two of his own tribute CDs, paying homage to his rock and roll roots with his versions of songs by Bad Company, Marvin Gaye and many others. With the release of his third solo venture, “Hurry Up And Wait,” the worldwide demand for his material increased dramatically. His next three solo albums—Holy Man,” “Slam!” and “JLT”—subsequently enjoyed critical and commercial success. Turner continues to record and collaborate on a massive number of other artist’s CDs and tribute albums. He is one of the key members of Brazen Abbot, a project spearheaded by Bulgarian guitarist/composer Nikolo Kotzev. JLT co-wrote and sang tracks on several albums and is spotlighted on the DVD “A Decade of Brazen Abbot.” His schedule is constantly booked with studio session work. It’s difficult to listen to the radio or watch TV in the U.S.A. without hearing his voice coming out of the speakers on a commercial. In fact, one of his beer adverts in Japan, “Challenge Them All,” became a popular rock radio anthem. Turner has recorded and performed with the Voices of Classic Rock (VCR), Rock and Pop Masters (RPM) and New York’s Hit Squad. These groups feature some of rock and pop’s elite: Hugh McDonald (Bonjovi), Mike Reno (Loverboy), Jimi Jamison (Survivor), Larry Hoppen (Orleans), Spencer Davis, Bobby Kimball (TOTO), Ricky Byrd (Joan Jett), Liberty DiVitto (Billy Joel) and many others. They have played festivals and concerts in South America, Japan, France, Asia, Hawaii, Central America, Mexico and in many major U.S.A. cities. Very notable is JLT’s collaboration with another former Deep Purple bassist/vocalist, Glenn Hughes. Turner asked Glenn to tour Japan in support of his “Holy Man” disc. They enjoyed working together so much that they were inspired to form the Hughes Turner Project (HTP). HTP released two studio CDs and one live disc. Chad Smith (Red Hot Chili Peppers), John Sykes (Whitesnake/Thin Lizzy), Steve Vai (Frank Zappa/Whitesnake) and other artists made guest appearances during the recording sessions. The single, “Time And Time Again” (“HTP2”) spent over 3 months in the Top 30 on the World Modern Rock Chart. HTP generated a lot of fan and media interest, worldwide, appearing on national television and radio in many countries, including the U.S.A. and Russia. And, after 2 successful tours of Japan and Europe, HTP remains a memorable and significant part of JLT’s career history. 2006 turned melodic rock fan on to the Sunstorm project. Serafino Perugino (Frontiers Records President) and Mario de Riso (Frontiers Label Manager) used to exchange tapes as fans. One day, Mario gave Serafino a cassette he had from a journalist, with the “unreleased Joe Lynn Turner” second solo album demos. This tape featured some songs originally slated for release on the follow-up to “Rescue You” in the mid-1980s. Taking inspiration from the material available, Perugino reconnected Joe Lynn with Jim Peterik, the legendary songwriter (ex SURVIVOR) with whom he collaborated with several years ago in Deep Purple. Turner went through some of the material sent by Peterik, along with a few other tracks submitted by Perugino and agreed to give birth to a project that could rediscover and highlight his melodic rock roots. “Sunstorm” was released worldwide in the Fall of 2006 and it has received rave reviews from critics as well as fans. The follow up, “House of Dreams,” was released in 2009. Joe has also been co-writing songs, lending his pipes to various projects and increasing his stateside visibility with more live shows than he has ever played since 1996. The year 2006 was highlighted by a return to working with Blackmore on a redux of the Rainbow classic “Street of Dreams.” It’s a duet with Candace Night (Blackmore’s Night). Turner also sang on all tracks on “Fire Without Flame,” a disc he collaborated on with Blackmore-inspired Japanese guitarist Akira Kajiyama. If all of this is not enough, JLT performed with the New Japan Philharmonic and went on tour with Turkish guitar virtuoso Cem Koksal. He also traveled to Nashville to form and record some video with Big Noize, a band that includes: JLT, guitarist Carlos Cavazo (Quiet Riot), drummer Vinny Appice (Dio/Black Sabbath), bassist Phil Soussan (Ozzy Osbourne/Billy Idol) and keyboardist Gary Corbett (Cinderella/Lou Gramm). In 2007, he released his 10th solo album, “Second Hand Life” in Japan, Europe and the USA. Among the highlights on the record is a song he wrote with Blackmore and Glover in the early 90s during his Deep Purple days called “Stroke of Midnight.” Other tracks include collaborations with Jim Peterik (Ex-Survivor), Martin Briley, Jack Ponti (who wrote several songs for Bonjovi) and former TV star, Deanna Johnston (Rock Star: INXS). JLT recently hooked up with Rainbow alumnus Graham Bonnet for a sold out tour of Japan in 2007 and had several more dates with Bonnet in 2008. Another memorable highlight of 2007 was a Command Performance for the Prime Minister of Russia’s cabinet and a USA tour with Brian Johnson and Cliff Williams of ACDC along with The John Entwistle Band as a member Classic Rock Cares (www.johnentwistle.org).